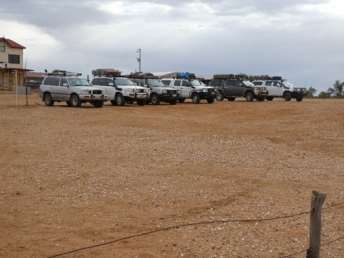 Eight vehicles were originally signed up for this trip. Unfortunately two couples had to pull out which left 6 vehicles and 13 participants. 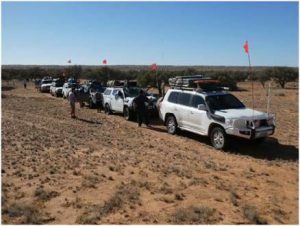 Participants: Pete & Elaine (Triton Dual Cab), Maria & Greg (Izuzu D-Max Dual Cab), Carolyn & Mark (Toyota LC 200), Deb & Steve (Toyota LC 100), Erica & Bill & Susan (Toyota Hi-Lux Dual Cab). 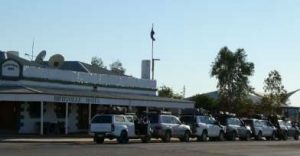 Munno Para Shopping Centre was the start of the Simpson expedition. Bill, Erica, Susan, Pete, Elaine, Barb, Trevor, Deb, Steve, Maria, Greg, Mark & Carolyn. The weather was perfect as we headed off to Jamestown for our first bakery and fuel stop. Once watered and fed we travelled on to Hawker where we had lunch and topped up on fuel and snacks. We saw heaps of emus (affectionately known as a ‘bush turkey’), kangaroos, foxes and sadly a whole lot of road kill. We arrived at Farina around 4pm. 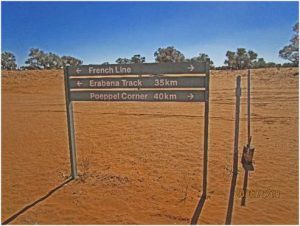 If you have never been to this place it was like coming into a small community rebuilding its settlement, with street sign names showing the layout of the old town which was a rail head for the local stations and original Ghan line. 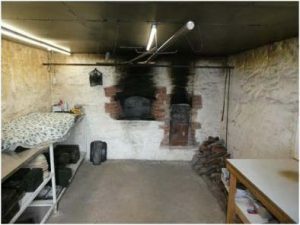 The renovation of buildings is being carried out by volunteers and even the old bakery has been rebuilt and operates for six weeks of the year, baking fresh bread and pastries to sell to the visiting tourists. The Farina campground had flushing toilets and a donkey shower with the campsite cost being $5 per person. It was a perfect location for our first night stop. gas canisters for our BBQs and stoves were too cold to operate – lesson number one learnt from the Trevor & Barb – ALWAYS take your gas canisters to bed with you to keep them warm. We left Farina at 9ish – it was beginning to warm up and was now a whole 2 degrees, to head to Maree for a fuel stop ($1.97 per litre for diesel) and a group show and tell of where everybody stores their recovery and first aid equipment so that if needed everyone could access it without hunting for it. 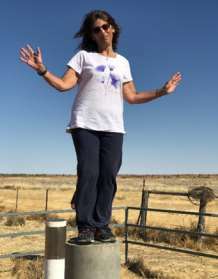 We arrived at the Lake Eyre South viewing area at 12.15 pm, where we helped out a very ill-prepared traveller heading in the opposite direction who was experiencing tyre problems (rough dirt road – tyre pressures 45 psi; staked rear tyre; no repair kit and a “toy” air compressor!). Plugged his tyre and pumped it up with Mark’s REAL compressor and then let the rest of his tyres down to a sane pressure. 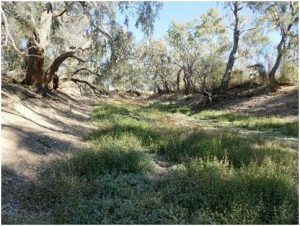 Onwards to The Bubbler Springs which is a mound spring fed from The Great Artesian Basin (GAB). 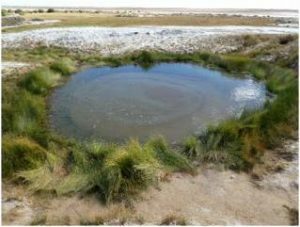 In many places the Basin water has pushed its way to the surface in the form of natural springs and The Bubbler is one of the 169 spring groups within the SA part of the GAB. 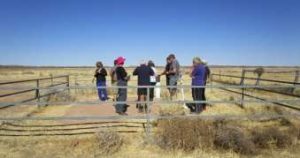 These springs have great significance for local Aboriginal people whose ancestors relied on them as watering points and as sacred sites for important ceremonies. Bill developed a puncture so with all hands on deck the tyre was replaced in 5 minutes. We had a quick stop for lunch at the Springs before heading to our final destination for the day – Algebuckina Bridge. 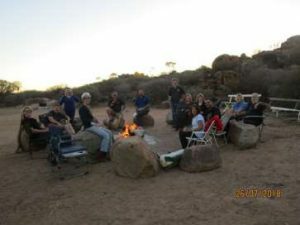 We found a lovely place to camp near the Algebuckina waterhole, on the opposite side of the bridge, where we spent the night around the campfire getting to know each other better. 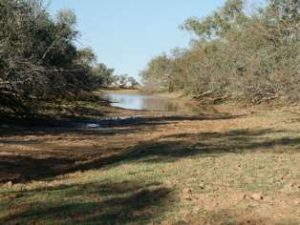 Waking up at the Algebuckina waterhole was warmer than Farina and quieter, except for the flock of Corellas that arrived at sun up. There was a brief moment of concern when Pete couldn’t find the car keys but fortunately Elaine knew where they were. It was a good reminder that taking your second set of car keys with you is always a good back up. 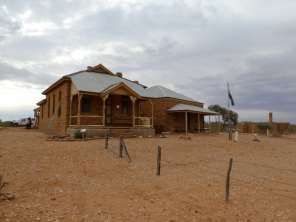 It was 7 degrees, as we headed out on to the Oodnadatta Track just on 9am, to the first stop which was very nearby. 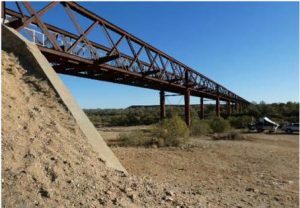 The Algebuckina Bridge is a magnificent example of Victorian era engineering. Most of us climbed up to admire it and walk out along the tracks as far as still permitted by the safety fencing. 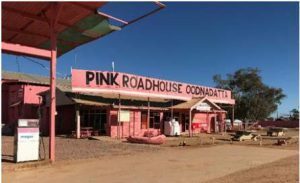 We stopped at the famous Pink Road House at Oodnadatta for morning tea. 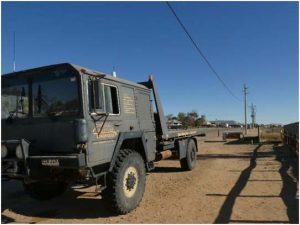 Bill took the opportunity to see if the tyre could be repaired but unfortunately it had to be replaced as an unmatched tyre and at the cost of $390. Some of us bought some reminders of the Pink Roadhouse and had a look around the town before heading back out to the track and up to Mt Dare. 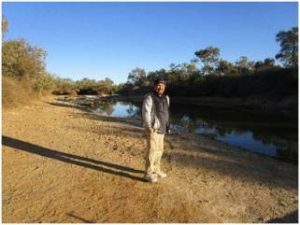 After lunch we headed out over the dry gibber plains before our next stop at the beautiful and amazing Eringa Waterhole. 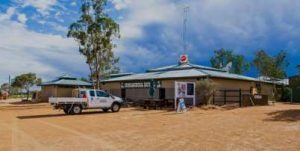 Then we braved the relentless corrugations on the road to Mt Dare where we enjoyed hot showers, flushing toilets and a delicious dinner with the group at the Mt Dare Station café. We woke to a crisp and clear morning. After packing up camp we departed Mt Dare at 8.45am. The start of the track was quite sandy. 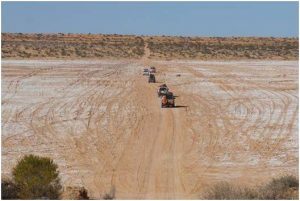 As there was no wind, it meant the dust hung around, so the convoy spread out quite a long way so that we could see ahead. It’s amazing to think you’re in the middle of Australia and it should be secluded, but there are so many others doing the same thing. The roads have been VERY busy! Twenty minutes out, the track started to turn rocky. Our speeds dropped to 20 to 30km an hour and it took a lot of concentration to avoid the sharp rocks. After travelling about 40km, the roads became sandier and corrugated, so speeds picked up a little. It was a quick morning tea break at Opossum Waterhole, which was dry, before continuing to the Dalhousie ruins. 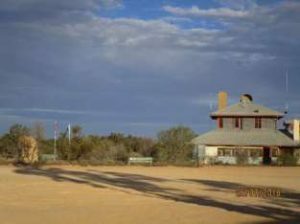 The Dalhousie Station was once a prominent homestead built 1872-1875 and South Australia’s most northern pastoral lease. 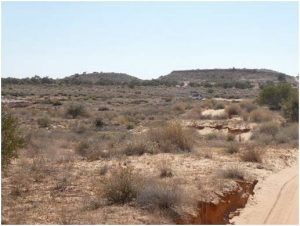 The land was used to graze and breed sheep, goats, horses, camels and cattle. 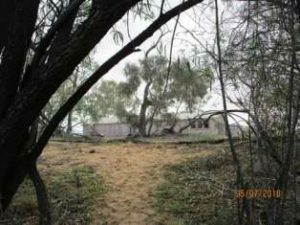 In 1925 the homestead was abandoned due to the amalgamation of several pastoral leases. Dalhousie Springs was a welcome sight and it didn’t take long to set up camp and have lunch. It wasn’t much after that before one, then two, then most of us headed to the hot spring to have a swim as it was quite warm in the sun. 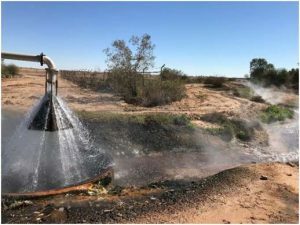 Dalhousie Springs is like a big upside-down shower rose discharging water from the Great Artesian Basin through around 80 holes called mound springs. 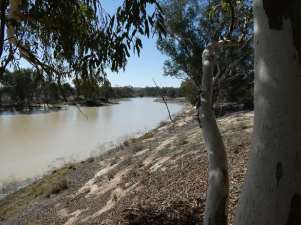 The water at the main swimming hole is around 34-38 degrees and up to 14m deep. It was amazing to see this beautiful place. We spent the rest of the day relaxing as well as checking equipment ready for commencing our desert crossing the next day. We were warned that the local dingoes stole food and rubbish from the campers. After dinner a couple of us reported missing rubbish bags. 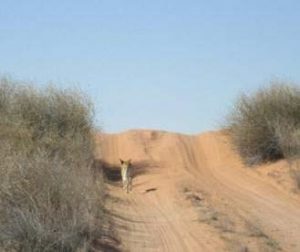 Barb must be a great cook, because a dingo stole Trevor’s empty dinner bowl and it was found out in the scrub the next day, licked clean! 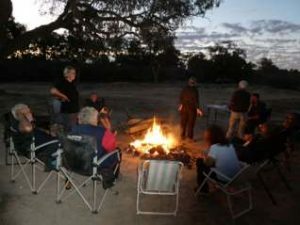 There was no campfire that evening due to National Park rules; and Steve, Deb, Peter, Greg and Mark ventured for a night swim. It was funny to watch them floating on pool noodles, with steam rising from the water, and headlight torches shining in the dark. It was a lovely night. Lessons learned from the day. 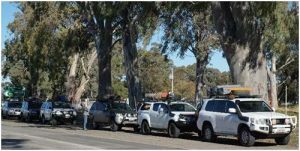 Don’t visit Dalhousie in the school holidays – the camp was like a caravan park in the Christmas holidays. And the desert skies are beautiful at night. In the morning Pete had found Trevor’s bowl that was stolen by a dingo the night before. 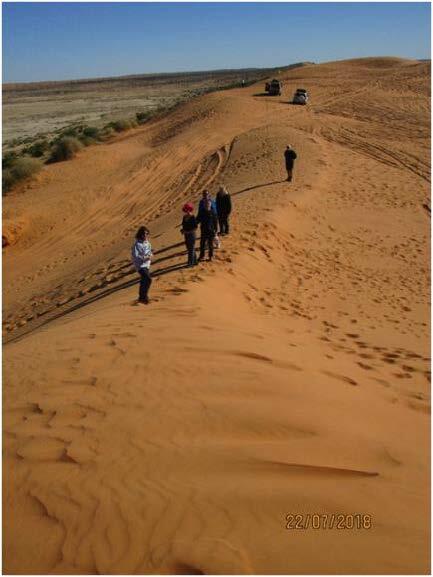 We got started at 8.45 am and were all pretty excited at actually getting into the Simpson Desert. 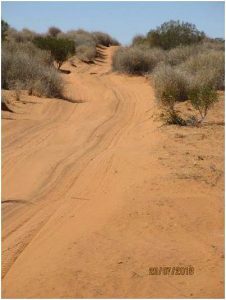 Heading out to Purni Bore, the road conditions were sandy corrugations!! We stopped for morning tea at Purni Bore where there was a lot of birdlife enjoying the flow of water. 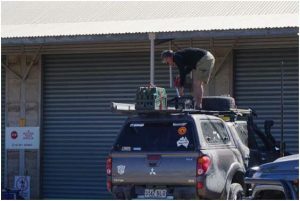 While driving, Pete’s roof rack had fractured but he was able to reposition the weight of the items packed up there and carry out repairs when we had set up camp in the afternoon. We had started on the French Line and headed towards the turnoff to the Rig Road and there was not much traffic. At 3.15 we pulled in to camp for the day with time for Pete to make repairs to his roof rack. 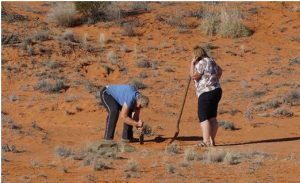 Deb and Barbara started to dig the toilet hole, then Greg took pity and went to help. Thank you to the toilet-hole diggers!! We broke camp just before 9am and set off along the Rig Road. It was a beautiful day, bright blue sky with no clouds and a light breeze. The sand dunes looked beautiful in the morning sun, a rich red complemented by the grey green bush. 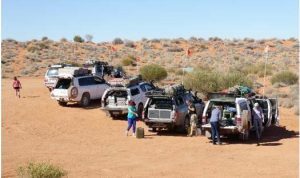 Traffic had dwindled significantly compared to the first few days, with a small group of campers and one convoy of three cars the only passing travellers. We had a quick stop for morning tea at 10.30am, then hit the track again. 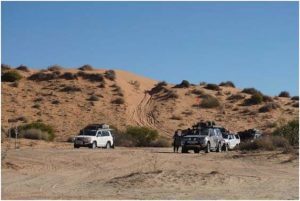 It wasn’t long before we came across a single set of dingo prints in the sandy track and we followed them for over 5km before sighting the dingo at the top of a sand dune! Was he heading for Birdsville too? 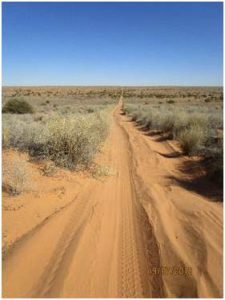 The track varied between hard clay and soft sand, smooth patches (which seemed few and far between) corrugations, dips and bumps. Trevor and Barb became stuck on some soft sand at the top of a dune, but managed to dig themselves out just as the Spraggs had reversed back to help. We had lunch at Walkandi Junction, then travelled the short distance to the Lone Gum Tree. 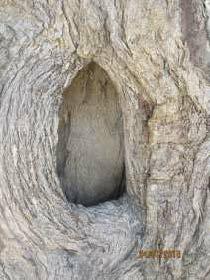 There were no koalas or jolly jumbucks spotted but there were three bird nests in this single Coolabah tree. Coolabahs are not found anywhere else in the Conservation Park and no one knows how it came to be there or how it keeps on thriving in this harsh place. It’s a long, long way from any creeks or rivers. 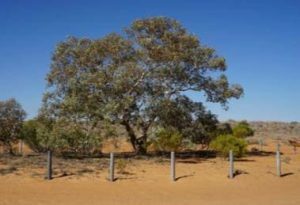 However, with a fence to keep tourists from walking too near and the rain that fell throughout the Outback over 2010-2011, this tree is no longer alone and has quite a few thriving seedlings growing with it. 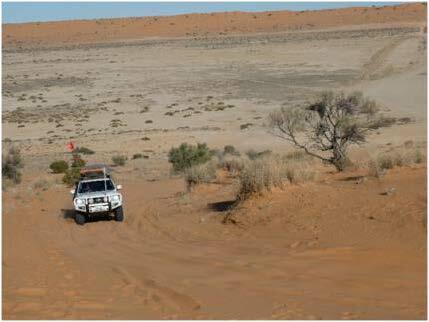 Day 7 started in the early hours of the morning when we all experienced our first Simpson Desert Sand Storm. It caused some people to get out of bed and collapse awnings and cover the campfire remnants, and lasted approximately an hour. As fierce as it came, it was gone. As usual we were all up ready to go by 8.50am. Today also marked our half way point across the desert and our holiday. Travelling was extremely slow with our first stop for morning tea at 10.30am. We had only travelled 32km. 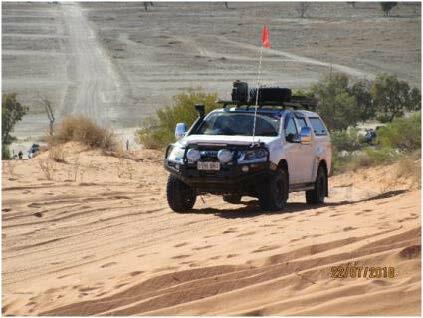 The slow progress was due to the constant corrugations, rock, and soft sand which only allowed us to travel at a speed of less than 20km an hour most of the time. 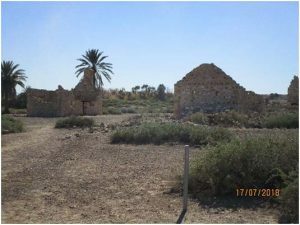 We stopped for photographs and lunch at the Approdinna Attora Knolls which are a unique and obvious feature in the desert landscape. After lunch we continued along the French Line and the sand dunes got bigger and further apart. A few of us got stuck and had to dig ourselves out or have a second go at getting up the dune. 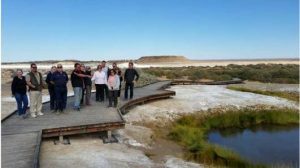 We saw some gorgeous scenery and especially loved crossing the salt lakes. We made it to the sign posts indicating the direction for Birdsville which after a long day was exciting. That night we were all impressed with Steve and Deb’s entertaining talents with coloured lights dec-orating their tent and a roast dinner complete with vegies, prepared in the camp oven and followed up with homemade apple/pear crumble and custard!! Then we all got to enjoy yummy damper prepared by Pete and Elaine. 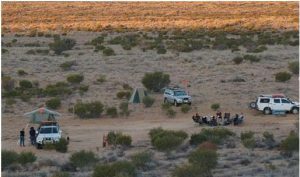 We awoke to a beautiful but cold morning in the desert (zero degrees), where we had made camp, approx 5 kms from the Poeppels Corner turnoff. After packing up camp we left just before 9am, to commence our 4th day in the desert. 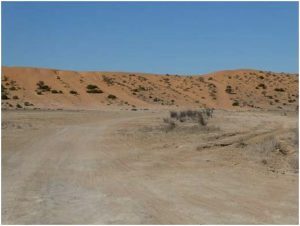 The Desert is such a beautiful place; such colour contrasts in the grey flood plains which merge into the orange sand hills and dotted with grey/ green bushes, determined to grow in this dry desert landscape. The most disappointing thing on this trip has been the amount of toilet paper littering the track and caught in, and between, bushes. It appears many visitors are determined to ruin this place of beauty for future generations. Decision time – to do Big Red or to not do Big Red! We reached Big Red late in the afternoon and it was decided we would not attempt it but would return the next day to ‘play’ on that iconic sand hill. So we all turned right and headed for Little Red. A couple of our vehicles had to have a couple of goes with a little more momentum required but we all made it over. 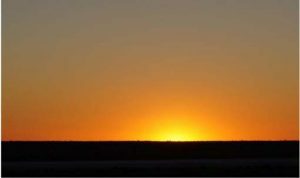 That was the end of a successful Simpson Desert crossing. Personally my first view of Big Red was an anti-climax for me as we had been climbing vegetated sand dunes all day, with them pro-gressively getting higher and higher until we crested quite a high dune to be greeted with an uninspiring barren sand hill which is Big Red. I’m not sure what I expected but thought it would be somewhat more magnificent than it is compared to others we had climbed during the day. 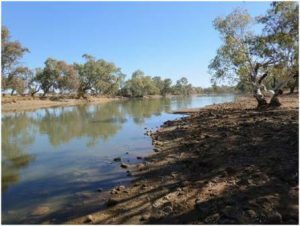 After putting air into tyres we proceeded to Birdsville where we had a beautiful camp site alongside the Diamantina billabong, sharing our camp with an array of kites, wedgies, ducks, pelicans, corellas, zebra finches, willie wagtails and reed warblers. 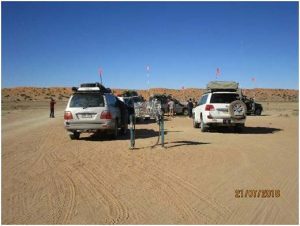 Everyone took advantage of not having to break camp and move on with this planned rest day in Birdsville. Most of us ‘got out of bed and dragged a comb across our heads’ to be out at Big Red at 9.15am before the maddening hordes arrived. It was lovely to drive beside the dunes before getting to the eastern side of Big Red and letting down the tyre pressures again. Mark, Greg, Steve and Bill all had fun going over and back up Big Red from the western side. The automatic cars were more successful in getting up the really steep and soft tracks but each of them can say they drove over Big Red. Returning to town, some wandered the streets visiting the historical sites, some repaired and repacked cars and did washing. 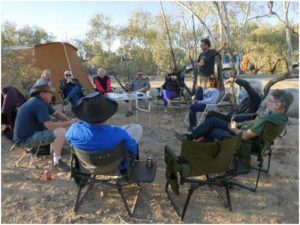 Everyone enjoyed lovely hot showers in excellent facilities of the Birdsville caravan park on the banks of the Diamantina. 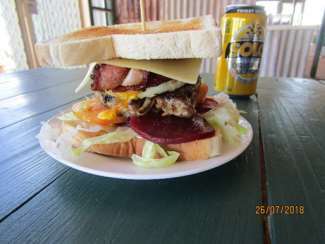 The day finished with a group dinner at the Birdsville Pub with very generous servings of Roast Beef or Chicken and veg. This was a popular spot…. After a mild night, we packed up camp and some of us headed to the bakery for breakfast. It was clear skies again. 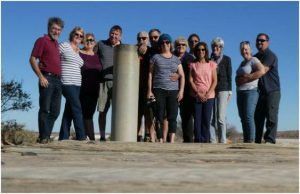 We gathered at the iconic Birdsville pub for photos and then we were on the move at 9am heading out toward Betoota with our destination, Haddon Corner, the top right-hand corner of SA. The trip to Betoota was fairly uneventful. 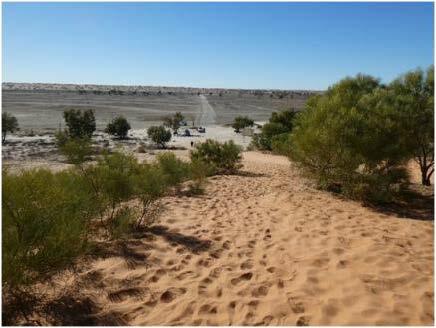 This side of Birdsville, the landscape became flatter (and greener in spots) then changed to vast gibber plains. 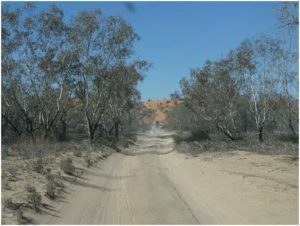 The gravel road was dusty; interspersed with small lengths of bitumen. Our convoy travelled at a steady 80-90km/hour. that collected tariffs for the movement of cattle, in the early 1900’s, it is being restored and is due to re-open as a pub at the end of August. 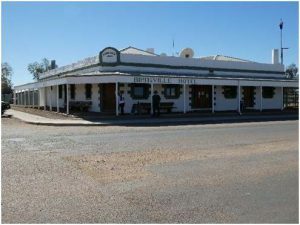 Betoota Hotel. A pub with no beer! 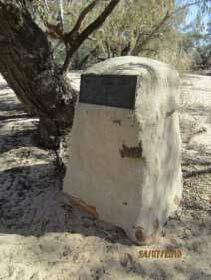 marker post in the middle of a dusty plain, out in the middle of no-where….And we still came across another vehicle! 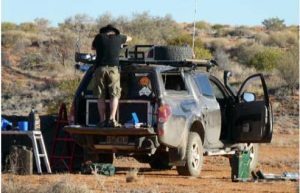 Driving through the dusty, barren landscape for another hour or so, we finally pulled up to our camp at Arrabury Waterhole. No green lawn and shelter tonight. We were only 40 km to the SA border crossing. There was plenty of firewood so we had a fantastic fire and enjoyed a really fun night together, solving the problems of the world, with a good friend, Captain Morgan. It was a late night, with most retiring to bed about 9.30pm. Lesson learned: If your partner says it’s a stupid idea to bring your hot water bottle, ignore them and sneak it in. You can even pre-fill it and keep reheating the same water over and over. Camping tip: place some paper towel in your bread bag to reduce moisture and to make bread last longer. 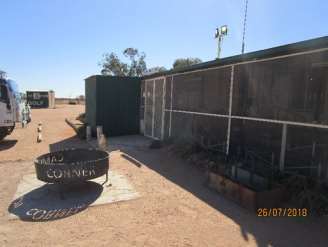 Since this was our last bush camp, BIG thanks to Chief Toilet Wardens Deb and Barb. We are very grateful for your service (and to Peter Pyman for lending us his bush toilet). Special thanks to Barb and Trevor for leading the trip. We’ve had a great time…. But it’s not over yet! 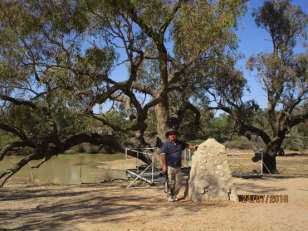 We left the Arrabury Waterhole at 8.40am, heading for the Dig Tree, Burkes Grave and Cullyamurra waterhole. Dig tree, cairn and Mark, the modern explorer! 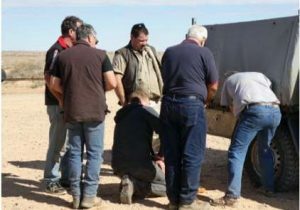 Bill had another flat tyre which was all sorted quickly with many helpers (Greg with his trolley jack and Mark with his rattle gun). 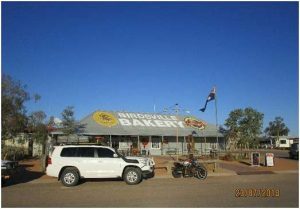 We arrived in Innaminka in the early afternoon and filled up (with fuel) ready the trip to Coongie Lakes the next day. Camp that night at the Innaminka Common and no need to dig the toilet!! Although we didn’t have to be so early (no tents to be packed up!) we were woken early by a ‘murder’ of crows. The crows are obviously long term residents and quite happy to come and raid unattended campsites, so thanks to the rubbish picker-uppers round Steve and Debs’ tent. Pete and Elaine had another visitor to their campsite, a dingo that was quite happy to lay in the sunshine a few metres from them. 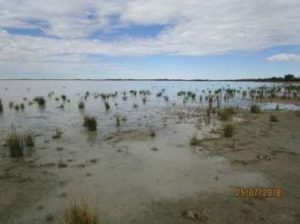 We set off to the Coongie lakes about 9am. The road was actually boggy in patches and some of the boys couldn’t resist going through some mud. 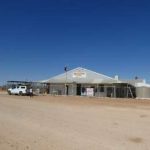 We had a short stop at Kudriemitchie outstation which was used to accommodate mustering parties from Innamincka. 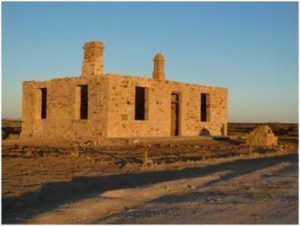 The building there is being restored by the Toyota Landcruiser Club in conjunction with the Department of Environment and Natural Resources. back to the campsite just after 3pm. 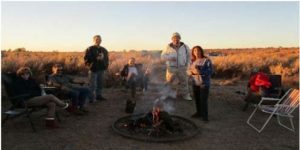 Hot showers were very popular ($2 for three minutes) before a ritual 5 o’clock nibbles round the campfire and then a group dinner at the Pub. It’s getting close to the final countdown. 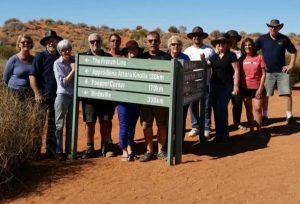 Day 13 is our second to last day that we spend together and we are leaving Innaminka to head to Tibooburra. We were originally going to travel along the old Strzelecki track but due to information received regarding the road conditions we decided to travel a different route. This wasn’t as interesting as the old Strzelecki track but nonetheless it was still spacious, vast and different. 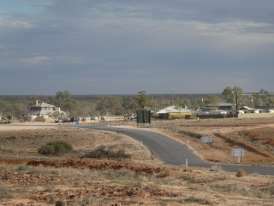 This area still passes through the vast Moomba gas and oil fields. 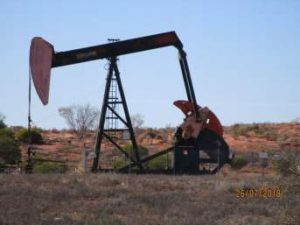 There was a considerable amount of infrastructure associated with the oil and gas extraction along the track. It was obvious when we left the gas area – the road deteriorated dramatically. 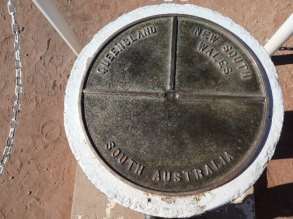 We had lunch at Cameron’s Corner which is divided between the Queensland, NSW & SA Border. 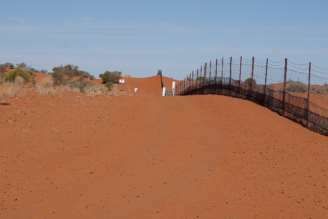 The famous ‘dingo fence’ also runs along this area. Cameron’s Corner has a great eating spot where some of us purchased steak sandwiches and hot chips! Whilst we ate lunch, Peter was busy repairing a slow leak in one of his tyres. It was great to see Greg and Mark assisting Peter with locating the leak and once this was found the repairs were done in record time. 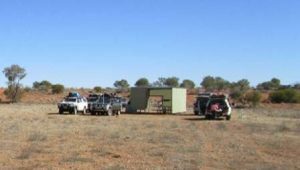 Happy and fed campers, we left Cameron’s Corner to head to Tibooburra to set up camp. 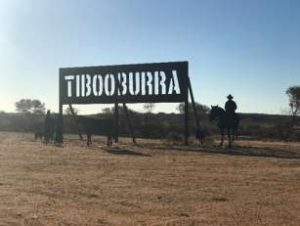 It was a long days drive and we were all excited to see the sign ‘Tibooburra’ when we heard the ‘flat tyre’ call from Erica! It was their 3rd flat tyre this trip, one could say ‘three strikes and you’re out’ or ‘everything come’s in three’s’. At least the men folk got plenty of experience in changing a tyre in record time! Well done to the Spragg pit crew! Tibooburra was a beautiful spot. We stayed in the Caravan Park which allowed us to have a magic campfire. Some headed off for dinner in the Pubs and a night cap at the Family Pub which boasts some wall art by the famous Clifton Pugh. Steve and Deb made us a lovely damper for dessert and finally we all went to bed around 10.30pm. We left Tibooburra just after 8.30 SA time and everyone was looking forward to only about 50km of dirt on the way to Broken Hill, hoping this would mean no more flat tyres from Bill!! 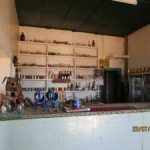 We stopped at Malparinka for a quick look around the one hotel ghost town. There must be a very active volunteer history group with a well curated and interesting set of buildings and museum to look through. We passed quite a lot of road kill and live animals, including a large black boar, and hundreds of kangaroos and goats and a couple of Australian Bustards. A small rain shower had fallen just before we drove through which attracted the kangaroos to the road side to drink from water that had filled small undulations and potholes and these were cause for a few stops as they seemed to persist in drinking rather than getting out of the way of vehicles. It was a cloudy day which created soft colours on the distant Ranges and hills and was really beautiful to look at as we enjoyed smooth roads and drove on the lasts few sections of dirt. A very big thanks to Trevor & Barbara and Steve and Val for their planning and preparation. 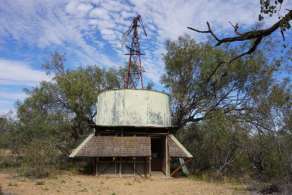 What a fabulous opportunity for us to see this unique part of the Australian outback, now all that remains is to review the hundreds of photos we have all taken well that’s apart from unpacking, seemingly unending clothes washing and servicing our vehicles. The trip report was done on a daily roster so that everybody had a chance to express their thoughts. Fuel carried – both tanks full – 132L (usable) plus 2 x 20L jerrys and 1 x 10L jerry.  Don’t do the trip during school holidays.  Tyre pressures are critical. 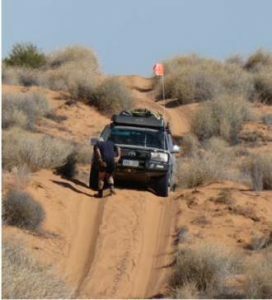 We used 14 front and 18 rear and other than two occasions when we had to have a second try, we climbed all of the dunes very easily. 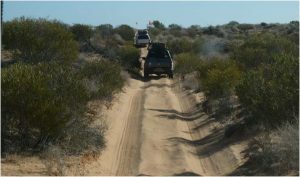  Trailers and high tyre pressures have caused huge scallops in all of the dunes. DO NOT TOW!  We watched one towing vehicle take 5 tries to climb a dune each time getting a little higher, and each time digging bigger ruts.  Tyres must have at least ½ tread – the dirt/gibber roads are tyre destroyers.